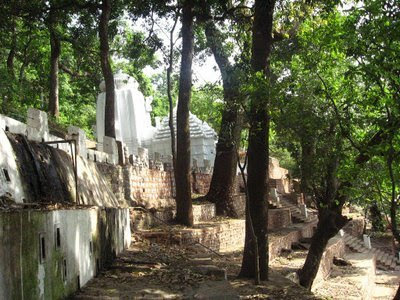 Kapilash is famous for Siva Pitha and Tapoban menas Forest or Park for Yoga and Meditation, the birth place of Mahima Dharma, when Mahima Gosain reached Kapilash Siva Pitha and started Atma Yoga Tapo and could see Lord Mahima in 1862 and started Mahima Dharma. The holly Mahima Ashram of Gosain is there now also for Saints of Mahima Dharma and also is being used as Bati Ghara. Every Year a Annual Function and Yatra is being performed there on 10th Day of Bright Half of Kartika month (Oct-Nov). Deep Forest High Mountains and Streams are all the composition of beautiies of Kapilash is attracting people to visit or to have a picnic with piligrim there. 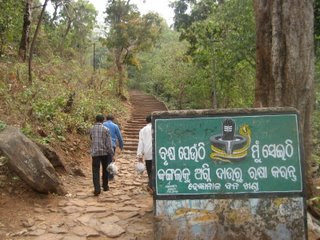 Kapilash is situated in the north east corner of Dhenkanal town at a distance of 26 Km from the district head quarters. 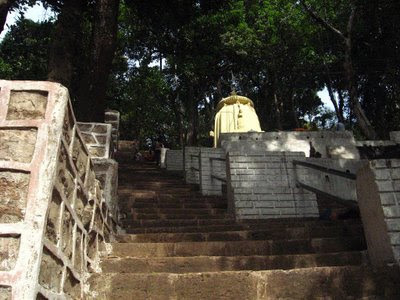 The temples are situated in height of about 2239 feet from the sea level. The temple is 60 feet in height. There are two approaches reach at the temple. One is through climbing 1352 steps and the other is 'Barabanki' or the travel twisting way. Narasinghdeva I constructed the temple for Sri Chandrasekhar in 1246AD.The temple has a wooden Jagamohana. Sri Ganesh, Kartikeya, Gangadevi, etc. Patita pavana Jaganath also remain in the temple as 'Parsa deva'. Lord Biswanath temple is also situated in Kapilas. 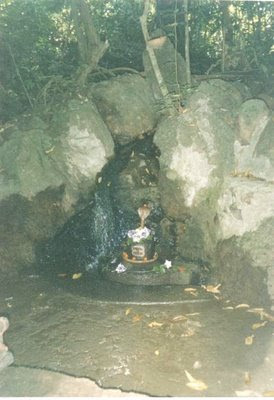 According to some scholors this temple is older than the Chandrasekahr jew temple, hence it is known as 'Budha linga'. There are many legends about Kapilas pitha and its significance. History says it was the ashram of Kapila muni, to some scholars it is the second Kailash of Lord Siva. Dridhar swami who wrote commentary on Srimad Bhagavatham stayed there. There are some monasteries in the premises. How to Reach: It will be about 100 KM from Bhubaneswar. Dhenkanal the District Head Quarter will be about 80 KM from Bhubaneswar and it is well connected with National High way and Indian Railways, you can find Taxi to visit Kapilash which will be about 26 KM from Dhenkanal. You can also visit Maha Binayak via Tangi and Chatia to Kapilash. Patali Bije: means The Lord Jagannath had visited Underground as was being hid in side underground Caves. It is learned The Sovanadeva, the King of Orissa fled from the Puri with the images of Lord Jagannath, Balabhadra and Devi Subhadra during the Raktavahu invasion and reached his western frontier in Sonepur and buried the images at a place called Sonepur-Gopali, and that after a lapse of 144 years, Yayati Keshari of Somavamsi dynasty got the images dugout, made new images, built new temple at Puri and enshrined them there. You may call the place as Patali SriKhetra or Patali Jagannath to our omnipresent Lord Jagannath. Kotasamalai : A place near Sonepur in Ullunda Block of Sonepur District is famous for its holistic approach due to presence of Lord Jagannath for about 144 years and was being worshiped in underground cave at a Hill there as due to insecurity of the SriMandir (Jagannath Temple) and state during Mughole Empire. Importance became increased: when a committee formed by the SriMandir Executive Committee visited the Place for bring its liveliness through giving touches of development with constant interest of District Collector, Sri Benudhar Das. How to Visit: Sonepur the Dist Hqr of Subarnapur District is 280 K.M s from Bhubaneswar via, Nayagarh, Dasapalla and Bauda and 300 K.M. via Dhenkanal and Angul, Rairrhakhol on National High Way. Again Kotasamalai is 23 KM away from Sonepur in North. You can hire Cars and Jeeps at Sonepur to Visit Kotasamalai. Have a Historic & Holistic Feeling, where the omni powerful the Lord Jagannath was kept himself in hide as a Role to teach the society, to how keep away from the abnormal situations. And learn from the place how he was maintained there for 144 Years of Patali Bije.